In Great Britain there are approximately 750 preserved steam locomotives. (This is a ‘guestimate’. We haven’t actually counted them all, so that if you have a more accurate figure, do please feel free to comment.) Of these, more than 500 are in working order. Of the remainder maybe some 150 are languishing in public museums. That gives us some 600 privately owned steam locomotives of which at least 5/6 are in working order. In Poland, it’s still difficult to be really sure as to what constitutes a ‘preserved steam engine’. Locomotives which everybody thought were preserved such as, Ty45-345 in in the Krzeszowice ‘Skansen’ or Ol49-18 which was a ‘technical monument’ in Lukow, are still being cut up in small batches. Counting all steam engines, there are still some 300 locos left in Poland of which, some 100 are in Barry scrapyard condition, another 100 are ‘technical monuments’ or languishing in the open air, another 70 are in reasonable ‘cosmetic’ condition and some 30 are in working order or not far from it. Of the 30 that are in or close to working order, 6 belong to local authorities that acquired ng steam locomotives when they took over narrow gauge lines, 1 belongs to the Bieszczady Forest Railway Foundation, and 19 belong to PKP Cargo or the National Railway Museum in Warsaw. That leaves us with 4 steam engines that are both in working order and are privately owned! Of these four, the first to be restored was Steve Crowther’s ‘Slask’ 0-8-0T which is in the custody of TOZK Pyskowice and has recently had its boiler certificate renewed. Second was 2-8-2T, Tkt48-18 which, though local authority owned, is actually in the long-term custody of the privately operated Museum of Industry and Railways in Jaworzyna Slask. Tkt48-18 was restored to working order with the financial assistance of a group of enthusiasts linked to Howard Jones and The Wolsztyn Experience. The third private engine to start running in Poland was Bill Parker’s small ex GWR 2-6-2T, 5521. But Bill’s engine wasn’t restored in Poland, and is only in the country for a short good will visit and is rumoured to be leaving Poland for good this autumn, so it’s a moot point as to whether we should even be counting her! The fourth private steam locomotive to be restored to working order is TKh 05353 which is the subject of today’s article. TKh 05353 was built in Chrzanow in 1953. Its boiler was built by WZBUP in Warsaw. It had been stored in the open for 10 years and all its steel sheetwork was in an appalling state when it was bought by PTK Holding S.A. a railway rolling stock repair company and freight train operator. 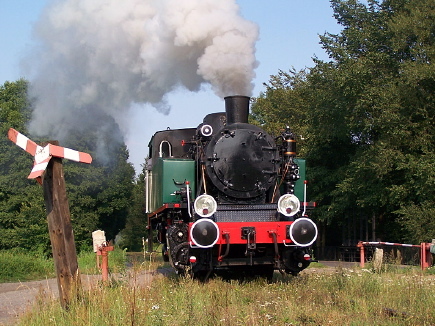 In August 2007 the loco arrived at PTK Holding’s workshops in Dzierzno. It was subject to a major rebuild as these pictures from the TOZK site show. (Click on a thumbnail to see a bigger picture.) New water tanks, a new cab and new coal bunkers were fabricated. The wheels received new tyres. A section of the boilerplate was removed to check for thickness and the boiler was retubed. The wheel bearings, coupling rod and connecting rod bearings, and springs were overhauled and defective parts were replaced. TOZK members, including former PKP fitters, worked alongside PTK staff and sometimes acted as advisors. The boiler was overhauled under the supervision of PPHU “Januszewski Wicher” S.C. The overhaul was completed only a few weeks ago, and Tkh 05353 was recommissioned on 27 August. The result is, as we’re sure you will agree, absolutely fabulous! This entry was posted on Thursday, 4 September 2008 at 01:30 and is filed under Uncategorized. You can follow any responses to this entry through the RSS 2.0 feed. You can leave a response, or trackback from your own site. Well done. All concerned should feel justly proud of their efforts. A magnificent achievement!! Maybe a bit big headed of me, but I trail blazed the way to restore a scrap engine, back to working order, with Ol49-12, back in 1996. The way of putting a loco back to steam, without a costly ZNTK’s involvement. 12 was the rule breaker, which allowed 4422, and others to be restored.